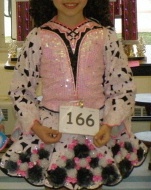 Accomplishments with this dress: Won the 2007 Mid Atlantic Region Oireachtas, 4th in the 2007 Great Britains Championship and 5th in the All Scotlands Championship. This striking 2 piece Gavin Doherty dress is in excellent condition. Bodice is made with light pink sequins. Sleeves and skirt made with light pink lace overlay against black satin. Underskirt is pink with black polkadots. Comes with matching bloomers, head piece and cape. Great on stage! Suitable for prelim/championship level. Asking Price: $US575. Shipping costs not included. Sale is final.